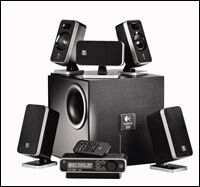 The Argument Solver, Logitech's Z-5450 Digital 5.1 Speaker System | OhGizmo! By David Ponce on 10/28/05 • Leave a comment! You should know that the only moderately acceptable way to enjoy a movie is with 5.1 Dolby surround sound, with your insides partially liquefied from excessive bass. Trouble is, until now, your significant other might have had an objection or two about all the wires needed to setup a proper 5.1 rig. Enter Logitech’s Z-5450 speaker system: a $500 solution. It’s a 315 Watt sound system that features rear speakers that connect wirelessly. Sure, you still have to plug them in, but not to the base. The rear speakers operate on a 2.4GHz frequency and are meant to be used within 28 feet of the decoder unit, though some users might be able to get much greater range. Note that 2.4Ghz is enough for uncompressed CD quality audio, though not quite enough for 24-bit, 96KHz data. Read a very thorough review of these units at Extremetech.